(AFP) - Leader Kim Jong-Un has ordered North Korea's nuclear arsenal to be readied for pre-emptive use at any time, in an expected escalation of military rhetoric following the UN Security Council's adoption of tough new sanctions on Pyongyang. The North's nuclear warheads must be deployed "on standby so as to be fired at any moment," Kim was quoted as saying by the North's official KCNA news agency on Friday. He also warned that the situation on the divided Korean peninsula had become so dangerous that the North needed to shift its military strategy to one of "pre-emptive attack". Such bellicose rhetoric is almost routine for North Korea at times of elevated tensions. Washington downplayed Kim's threat as posturing. "We have not seen North Korea test or demonstrate the ability to miniaturise a nuclear weapon and put it on an ICBM (intercontinental ballistic missile)," a US defence official told AFP. Still, the official added, "our forces are ready to counter-eliminate strikes if necessary". In Seoul, President Park Geun-Hye promised South Korea would mete out "stern punishment" in the event of any North Korea provocation as she warned of a "fiercer" backlash than usual from Pyongyang over the latest UN sanctions. According to KCNA, Kim made his comments while monitoring the test firing of a new, high-calibre multiple rocket launcher on Thursday, just hours after the UN Security Council unanimously adopted the US-drafted resolution penalising the North for its fourth nuclear test in January and long-range rocket launch last month. 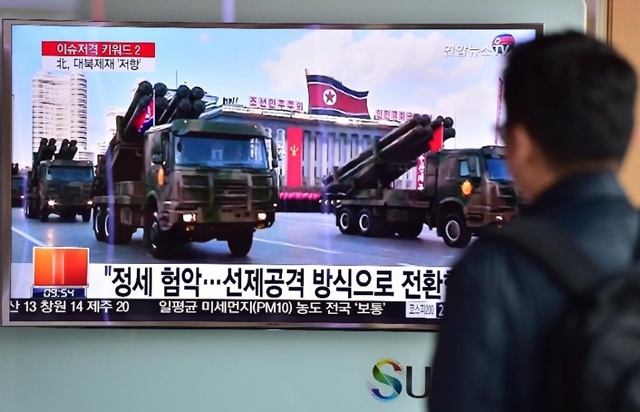 South Korea's defence ministry said the North had fired half a dozen rockets about 100-150 kilometres (60-90 miles) into the sea off its eastern coast on Thursday. In a clear threat to the neighbouring South, Kim said the new rocket launcher should be "promptly deployed" along with other "recently developed" weaponry. In the wake of the "gangster-like" UN resolution pushed by the United States and its South Korean ally, North Koreans are now "waiting for an order of combat to annihilate the enemy with their surging wrath", he added. The Security Council resolution adopted late Wednesday laid out the toughest sanctions imposed on Pyongyang to date over its nuclear weapons programme and will, if implemented effectively, apply significant economic pressure on Kim's regime. It breaks new ground by sanctioning specific sectors key to the North Korean economy -- such as mineral exports -- and seeking to undermine the North's use of, and access to, international transport systems. Kim said the resolution had opened a "very dangerous phase", coming just days before the United States and South Korea kick off annual joint military drills that Pyongyang views as provocative rehearsals for invasion. The exercises involving tens of thousands of troops are scheduled to begin next Monday. The Security Council resolution ushered in the fifth set of UN sanctions to hit North Korea since it first tested an atomic device in 2006, and was the result of arduous negotiations between the US and China, Pyongyang's sole major ally. China had been reluctant to endorse tough sanctions out of concern that too much pressure would trigger the collapse of the pariah regime, creating chaos on its border. The measures Beijing finally signed off on are extremely tough on paper, but experts have warned that some of the language is vague enough to allow varying levels of enforcement. China's commitment could depend on the outcome of formal talks that opened Friday between Seoul and Washington on the possible deployment of an advanced US missile defence system in South Korea. The THAAD system fires anti-ballistic missiles to smash into enemy missiles either inside or outside the Earth's atmosphere during their final flight phase. Its deployment is strongly opposed by China and Russia, with Beijing saying it would undermine its own nuclear deterrent and has the potential to "destroy" relations with Seoul.